The show La sottile linea del tempo. Opere dalla collezione AGI Verona, curated by Marinella Paderni, will be inaugurated on Friday 9 October at 6.30 pm. It has been realised in collaboration with the Fondazione Museo Minischalchi-Erizzo, and organized by the Accademia Cignaroli e Suola Brenzoni di Pittura e Scultura Verona. In its search for new ways of creating exhibitions based on a dialogue between the art of the past and that of the present, the Minischalchi-Erizzo museum in Verona has requested that the AGI contemporary art collection be placed in a relationship with its own collections of antique art and thus exhibit a significant group of contemporary works among the paintings, sculptures, reliquaries, furnishings and books inside the museum. This meeting of visions, sensitivities, and different historical contexts has given rise to a curatorial project that examines the modern concept of a universal museum (the producer of new differences beyond historically recognisable differences) and the role of art collections today. Active expression of non-linear historical time and of a transversal cultural memory, and receptive to differences, art collections allow the appearance of what is new on the basis of increasingly free, profane and extraordinary connections, ones that lead to heterocrony – the assembling and stratification of forms that come from other places and times. 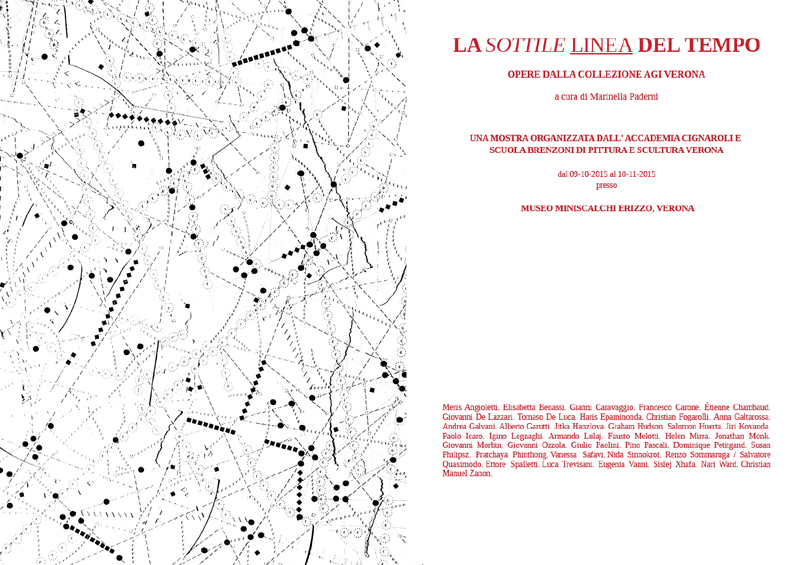 Among the artists: Meris Angioletti, Elisabetta Benassi, Gianni Caravaggio, Francesco Carone, Étienne Chambaud, Giovanni De Lazzari, Tomaso De Luca, Haris Epaminonda, Christian Fogarolli, Anna Galtarossa, Andrea Galvani, Alberto Garutti, Jitka Hanzlova, Graham Hudson, Salomon Huerta, Jiri Kovanda, Paolo Icaro, Igino Legnaghi, Armando Lulaj, Fausto Melotti, Helen Mirra, Jonathan Monk, Giovanni Morbin, Giovanni Ozzola, Giulio Paolini, Pino Pascali, Alessandro Pessoli, Luca Pessoli, Dominique Petitgand, Susan Philipsz, Pratchaya Phinthong, Vanessa Safavi, Nida Sinnokrot, Renzo Sommaruga/Salvatore Quasimodo, Ettore Spalletti, Luca Trevisani, Eugenia Vanni, Sislej Xhafa, Nari Ward, Christian Manuel Zanon.